Born with that Philadelphia attitude and now marinating in the Florida Keys for 27 years, Paul Menta is a food-curious creative chef who will go into anyone's kitchen to learn a family dish. He draws from his experiences traveling abroad when theming his restaurants and when he's not writing columns or appearing on camera, he is on the water in Key West. 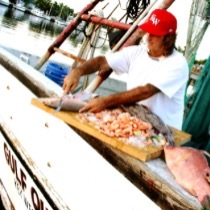 A professional kite boarder, rum distiller at Key West First Legal Rum Distillery and co-founder of Three Hands Fish, he feels truly blessed to have his passions be his profession. Paul's extreme nature brings excitement to every project and he will inspire readers with his new book series, NATIVE FUEL.